Paraiso del Mar in in La Paz, Mexico is a 1,700-acre development that will include houses, condos, hotels, restaurants and an Arthur Hills-designed golf course. The course figures to make Paraiso del Mar one of the most buzzed-about openings in years. It sounds like something from another time and place. The golf course sits on a peninsula in the striking Sea of Cortez. It's right across the bay, a short water taxi ride from a charming Mexican town where strip mall America commercialization doesn't exist. Arthur Hills will tell you it sounds like it's from another time because it practically is. "La Paz has these boulevards and plazas that you just don't see these days," Hills said of the town that the new Paraiso del Mar development sits across the water from. "It's kind of like one might imagine Fort Lauderdale was like 80 years ago or something." Yet it's only a two-and-a-half-hour drive from Mexico's high-end resort corridor of Cabo. Or a two-hour direct flight from Los Angeles. Paraiso del Mar - a 1,700-acre development that will include houses, condos, hotels, restaurants and an Arthur Hills-designed golf course scheduled to open in December - is something unique that isn't in the middle of nowhere. Hills believes it's a one-of-a-kind setting for Mexico. "It's on a peninsula that's like a mile across or something and there all these sand dunes," he said. "The growth on it is maybe eight to 12 feet high. That's it. It doesn't reach any higher so it makes for a very unique look with the course rolling out in front of you." 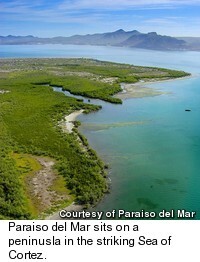 When John Fair and partner Luis Cano heard that the land that would become Paraiso del Mar was up for bid, they quickly jumped on it. "The land was owned by the state government, and when we were asked if we'd be interested in developing it, Luis immediately said, 'Yes, yes,'" Fair said. "He knew what the land they were talking about was and said this was a once in a lifetime opportunity. "And you can see it. It's such a unique piece of land. All the sand dunes remind one of Scotland, Ireland or even some of the great courses built along Long Island." Hills convinced Fair he was the right architect for the job when, upon seeing the site, the architect remarked, "I want to just barely breathe on it." 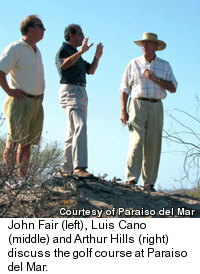 "In the typical Nicklaus, Fazio project in Cabo, 1 to 2 million cubic yards of earth are moved," Fair said. "We've moved about 70,000." Hills took advantage of the scenery already there at the peninsula of Paraiso del Mar instead. "Out on No. 16, you can see the Sea of Cortez," Hills said. "It's visible on three holes. We've got a par 3 that's right along the water." It's the course and everything around it that figures to make Paraiso del Mar one of the most buzzed-about openings in years. This isn't geared to compete with Cabo. Instead, it's the anti-Cabo, a much more quiet place with a much more authentic Mexican town. La Paz is a 414-year-old city of 190,000 people with a seaside boardwalk and a group of nearly 50 dolphins who look for fish five miles off the beach of the Paraiso del Mar development. The town's name translates to "the peace." Fair expects the Americans who make his community their second home will have another feeling as well, though. "You're going to feel like it's an adventure," Fair said. "Playing the course, the way Arthur's setting it up, it's going to feel like an adventure. Being in this 400-year-old town that isn't full of tourists is going to feel like an adventure. "It's something different, and I think there are plenty of people looking for that these days." The Arthur Hills golf course is geared to make people want to purchase the homes and condo villas on site - and to draw vacationers to the future hotels - of course. Yet Fair seems to look at it as more than just a money-luring amenity. A dedicated golfer himself and former top junior player, Fair is a member at the exclusive Castle Pines near his company's base in Denver. Before that he lived at Pebble Beach and played the Spyglass and Pebble Beach courses almost every day he was home. He talks about the new Arthur Hills course at Paraiso like a golfer would talk about it. "Arthur's done a terrific job of creating a balance in how the course plays," Fair said. "The short approach shots to the greens are extreme. The longer approach shots are not so extreme. 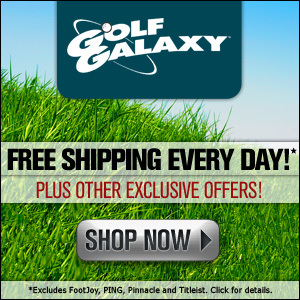 The fairways are actually good sized, but there's a big difference on how you need to play to the greens." Hills himself likes how the course's grasses blend together. He elected not to dramatically sculpt the edges of the fairways on this 7,100-yard layout, letting them merge into the rough instead in the kind of seamless look you find in Chambers Bay, the United States Golf Association's new favorite son in the Seattle area. The focus is on the natural over anything contrived. "I'm not a fan of Mickey Mouse ears in the sand traps," Fair said. "We're going for a different experience. I love traditional golf, the kind of thing that Arthur and Tom Doak and [Ben] Crenshaw bring about." You don't go back to the future in La Paz to see McDonald's after all. For more information on the Paraiso del Mar real estate development and new Arthur Hills golf course, visit www.paradiseofthesea.com or call (888) 201-2825.